then turns to offer a dun back, and turns again. box that framed our living-room air-conditioner. first moved in, glorying in the height, the ample shade. beak to harshly call from your perch in a sugar maple? fly toward me when I ask you for a sign. along the shifting lip of foam. Penny Harter is a poet and teacher whose work appears in many print and online journals and anthologies. 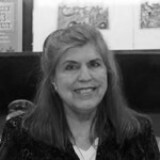 She has received fellowships from the NJ State Council on the Arts, the Poetry Society of America, and the Virginia Center for the Creative Arts. She also received the William O. Douglas Nature Writing Award, and was invited to read at the 2010 Geraldine R. Dodge Poetry Festival. After her husband's death in October, 2008, Penny moved to the South Jersey shore area to be near her daughter and family. She has many collections of poetry in print; her most recent books are a children's alphabestiary, The Beastie Book, and Recycling Starlight, a chapbook of poems reflecting her grief during the eighteen months following her husband's death. With her late husband, William J. Higginson, Penny co-authored The Haiku Handbook, reprinted last year in a special 25th anniversary edition. Learn more about Penny here. Bless you all for your kind comments about my poem. I was away in Seattle at the Haiku North America conference when it was posted, got home last night, so am just now checking responses. Penny, I cried for you when I read this. A very beautiful poem! Thank you. I like to think my dear dead friends have reappeared as ravens and morning doves that call to me from the woods. Or "shape-shifted into a blue-jay" that visits us each spring and makes a ruckus. A lovely poem. Thank you for sharing this very tender poem of loss.